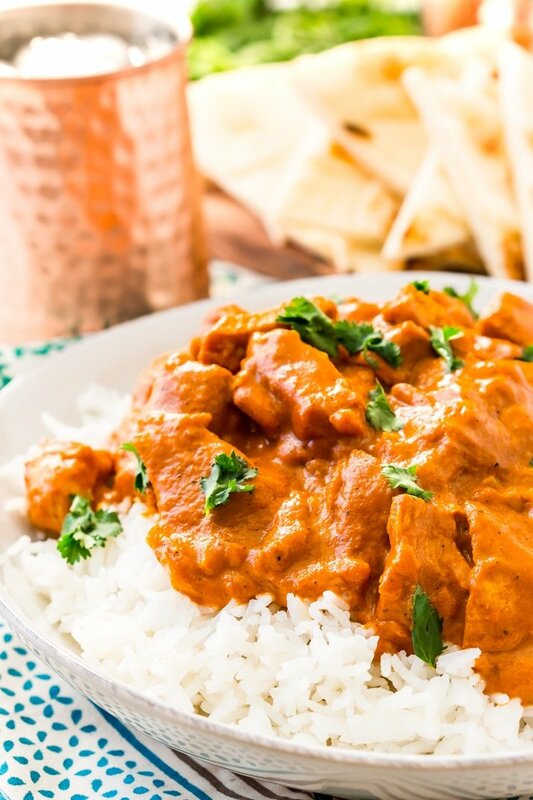 This Easy Chicken Tikka Masala Recipe is a delicious British Indian recipe made with a rich and creamy tomato curry sauce loaded with bold spices and chicken. 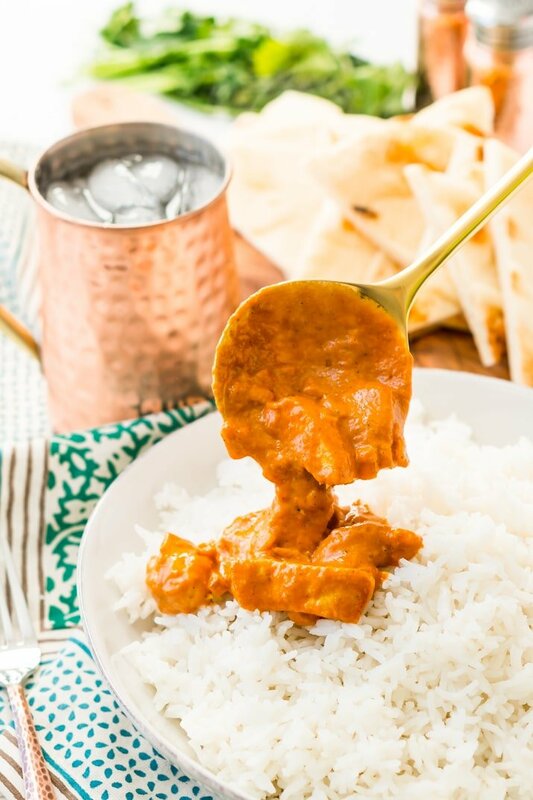 This Chicken Tikka Masala recipe is an easy family favorite, loaded with bold flavors and a creamy sauce that you won’t be able to get enough of! My first experience with Indian food wasn’t the greatest, I was in high school and had no idea what I was ordering. I don’t remember what I ordered, but I don’t remember loving it either. Maybe it just wasn’t a great restaurant, I don’t know, I’ve never been back. However, as I’ve gotten older and the more I’ve traveled, I have grown to truly love Indian food. My reintroduction to it came at Epcot, I’d never had butter chicken before, but as soon as it hit my mouth, I was instantly in love. But it’s not butter chicken that I love the most, it’s actually Chicken Tikka Masala. While very similar, the two dishes are different. And one of them didn’t originate in India! 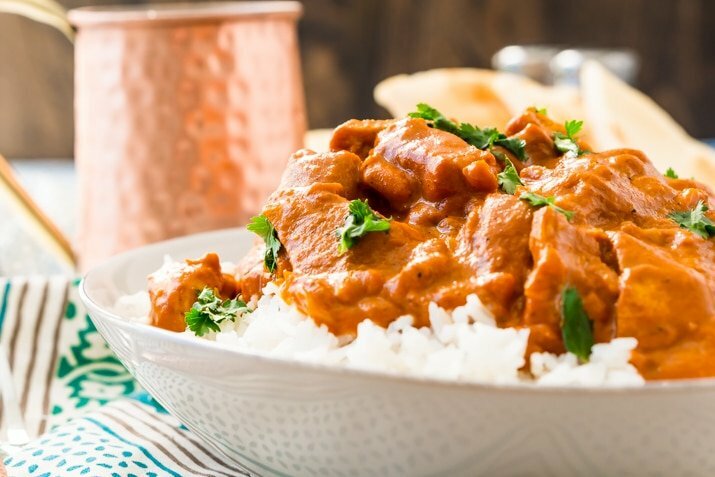 Where did Chicken Tikka Masala originate? Glasgow, Scotland. Yep, that’s right, or at least most believe that to be the case. Rumor has it, sometime in the 1960s, Pakistani chef, Ali Ahmed Aslam, the chef at Shish Mahal restaurant made Tandoori chicken too dry and a customer sent it back, so he mixed it up with tomato soup, cream, and additional spices. And chicken tikka masala was born. Well, since there are endless variations of each of them, this one is a little harder to pinpoint. Both are a tomato cream sauce with chicken and spices, but they actually taste quite different. Here are some of the key differences between the two dishes. Preparations have changed over the years and across the world, but they do remain different recipes of different origins and flavors. I haven’t been to India (yet) and I can only imagine that however tasty American and UK versions of these recipes are, they will never quite touch the real thing. Have any of you seen (or read) The Hundred-Foot Journey? It’s such a beautiful story about an Indian immigrant family, food, and love. 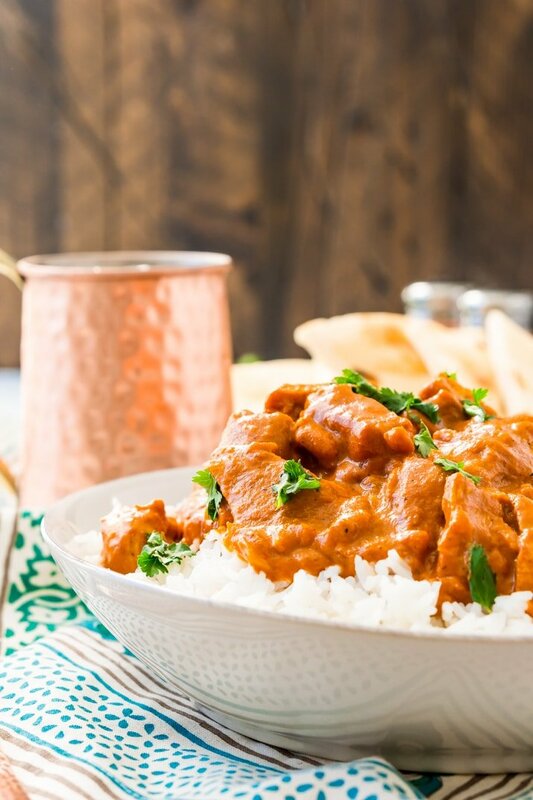 You must watch it if you haven’t already and I bet you’ll be craving this Chicken Tikka Masala by the end of it! So the recipe I have for you today isn’t what I would call authentic, but I would like to think that it’s a great American take on the classic chicken tikka masala, and the best part is that I’ve made this EASY. Seriously, this deliciously spicy and creamy dish only takes around 30 minutes to make! And it reheats well! And yes, we’re kind of cheating a little, normally, you’d use chicken tikka in chicken tikka masala, which is chicken that’s been marinated in yogurt and spices and then grilled. But as a busy woman who lives in what is currently frigid Maine, I won’t be doing any grilling anytime soon. I’m also that worst at planning meals ahead which means I tend to forget to marinade things. And well… dishes. But I promise the masala part of this recipe (the sauce) has enough flavor that your taste buds will still be doing a happy (spicy) dance! Spices – And a whole lot of ’em! You’ll use a good mix of coriander, garam masala, cumin, smoked paprika, turmeric, cardamom, cayenne, and cinnamon in this dish. Like I said before, this recipe packs a ton of flavor! Chicken Breasts – You’ll want to use boneless skinless breasts in this recipe, after cooking them in a pan, you can cut them to whatever sized chunks you’d like before adding them into the masala sauce. Tomato Sauce – This is NOT pasta sauce, this is straight up tomato sauce out of a can! This gives the masala it’s delicious tomato base. Heavy Cream – Heavy whipping cream is fine too if that’s all you can find. But half and half, light cream, and milk just won’t do. You want this recipe to be rich and creamy! A Large Pot – Even if you don’t fill it, I find it easiest to cook this recipe in a large pot like this one. You want to make sure to have a large surface area to heat the sauce. A Skillet – You’ll want to cook the chicken separately in a skillet. I like this non-stick pan for easy cooking and clean up. Add the diced onion and butter to a large pot over medium heat and cook until onions are translucent, stirring frequently for about 5 minutes. Add garlic and saute for about 2 to 3 minutes, stirring frequently so as not to burn. If more butter is needed, feel free to add a little. Add in half of the spice mixture and stir to combine. Add tomato sauce and heavy cream and the remaining spices and stir to combine. Continue to cook over medium-low heat until sauce thickens, stirring frequently. The cook time can vary depending on the type of pan and stove you're cooking on, but generally between 10 and 15 minutes. While the sauce is cooking, slice chicken breasts into two filets each, creating four equally sized pieces, season the chicken with salt and pepper. Add vegetable oil to a large pan and cook the chicken breasts over medium heat until golden brown on both sides and the internal temperature reaches 165 degrees F.
Chop the chicken into chunks and add it to the sauce, let lightly simmer for a couple of minutes. Serve over basmati rice with naan bread. Chicken Tikka Masala is generally spicy, but you can control the amount of spice in the dish with how much cayenne pepper you add. I would recommend about 1/2 teaspoon if you like things a little milder and then work your way up from there a 1/2 teaspoon at a time. Remember that the heat will build, so if you have leftovers, they're likely going to be hotter than when you first made the dish. 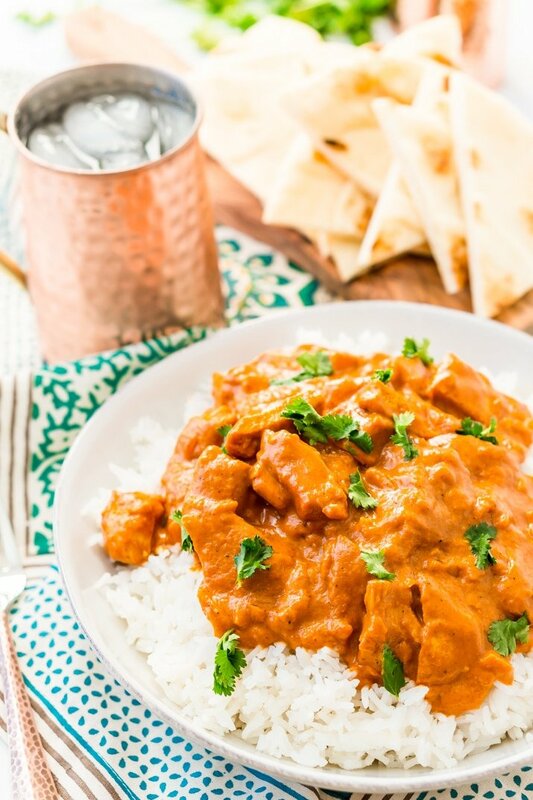 Pin this Chicken Tikka Masala Recipe for Later! Mouthwatering!! Curry in general has such a presence in the UK (national dish now, I believe) and it is so tasty there. My extended UK family goes out for “a curry” all the time. Love your modern day accessible version!! Yes, Samantha. It will never quite be what you’d get in a traditional curry house, but it’s a much more approachable version for the modern family! I heard it was now the National Dish, so fun! I still dream about all the curry I ate in Scotland and miss it so much! Absolutely in love with that sauce <3 Can't wait to try making it at home! You’re going to love it, such a quick and delicious dinner! Girl, you are making magic over here. This looks AMAZING- defintiely need to try! Your nutritional facts say 11 carbs, is that before or after rice? Hi there, the rice is not included in the nutritional calculations since many choose not to serve this dish over rice. Made for school project. Was amazing!